Summary : This tea smells, and tastes, like maple syrup. So the moral of the story is, if you like maple syrup slobbered over everything, I have a difficult time imagining you won't enjoy this tea. Review : I was feeling very experimental tonight. I have no shortage of teas that sound "unique" and "interesting." But still, I wanted something WAY out of the ordinary. And so, in that frame of mind, I dug through some tea samplers I was sent by Little Snowbird Teas, who make teas for kids and adults with sweet tooth's...such as myself. 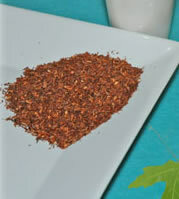 The first tea that I pulled out sounded very intriguing and was called Maple Morning, a Rooibos Tea. Now, I use to live in Vermont. You know...maple syrup capital of the world, as well as a place where maple syrup is literally dumped on everything and anything (maple syrup french fries, anyone?). And while I'm not quite that big of a maple junkie, there was no way I was NOT going to sample this tea this morning...the idea of a maple tea was just too intriguing. Here is how Little Snowbird Teas describes this tea on their website : "We call this tea Maple Morning because it reminds us of pancakes for breakfast on the weekends. A treat that won't soon be forgotten!" I was exceptionally impressed with the fragrance of this tea. Soon as I pulled open the bag, wow, can we say a strong aroma of maple? Like so strong, despite the dinky little bag I had, I soon had the aroma of maple drifting around my kitchen. Needless to say, I was impressed. Now, I only hoped the flavor of this tea would match this delightful fragrance. Admittedly, my very first sip I was disappointed with. On the first sip, the tea tasted exactly like a straight rooibos tea. So I put the tea cup down to reflect on life in general and the tea in particular, and then it hit me. The flavor of maple, complete with the sweetness I was so much hoping to find in this tea. Apparently, this tea for reasons unknown to me has a "delay" between when you drink it and when the flavor of maple hits your taste buds. Why? No clue. Once the flavor of maple hits your tongue, well, let's just say if you like maple things you can't help but like this tea. This tea tasted "more maple" than many maple candies I've had. And once the flavor hits your tongue, the flavor remains seemingly forever...or until you take your next sip, where it disappears for 10 seconds or so, only to come roaring back to life. I found this delayed maple flavor quite intriguing. You'll have a strong taste of maple in your mouth, you take a sip and it vanishes, and then comes roaring back even stronger than before about 10-15 seconds later. Very odd. But you know what...who cares! What counts is the maple flavor and this tea has plenty of maple flavor to soothe the most die hard maple fantatics around. Recommendation : Yes. If you love maple candy, maple syrup or just about anything else that has "maple" of one kind in it, this tea totally has your name on it. Just give this tea a "bit of time" after your first sip for the full flavor of maple to kick in.